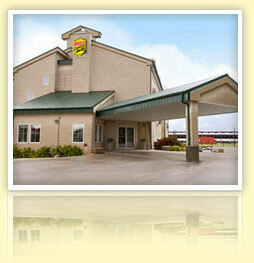 We are situated on Highway 75, halfway between Winnipeg, MB and the Pembina, ND Canada/U.S. border crossing. The Provincial Truck Highway (PTH #75, or the Manitoba Highway #75) runs from Winnipeg through Morris, and gradually becomes Interstate 29 (I-29) in the United States, eventually extending to Mexico. 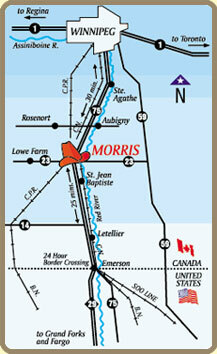 Morris is the only Canadian community on this artery in which PTH #75 serves as the town's Main Street. Morris is strategically located to capitalize on the emerging north/south trading alliance called the Mid-Continent Trade Corridor, which is one of the fastest growing north/south trade routes between Canada, the U.S. and Mexico. Morris is situated in the Hub of the Red River Valley, at the crossroads of PTH #23 and #75 which connects with numerous Midwestern U.S. interstate highways. Copyright © 2014 Morris Stampede Inn. All right Reserved.